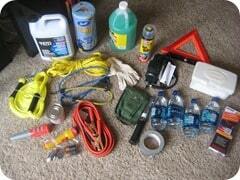 An emergency car kit is smart because most of us spend a good deal of time with our vehicles. They are typically with us (or close by) most anytime we leave home. 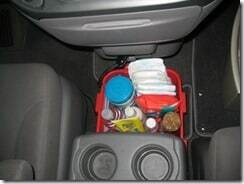 As such, it is a good idea to keep emergency supplies in our vehicles. If we aren’t at home, we will likely be where our vehicle is. Is an Emergency Car Kit Really Necessary? I keep our main 72 hour kit go-bag in our van. 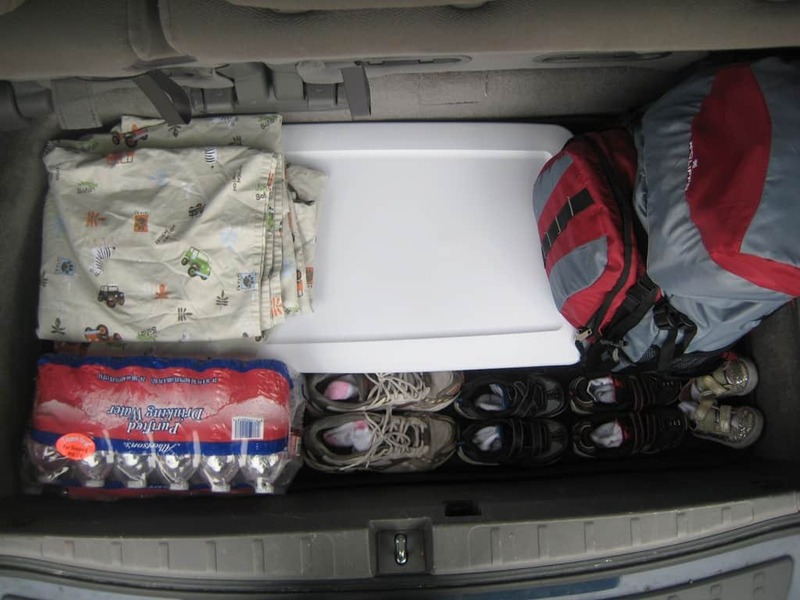 So for a long time, I rationalized that I had everything I needed in there and didn’t really need a separate car kit. But, a few years ago, my blog readers began asking about my car kit. So, I gave it more thought. In doing so I actually came up with quite a few situations that I was completely unprepared for: some small, some far more serious. 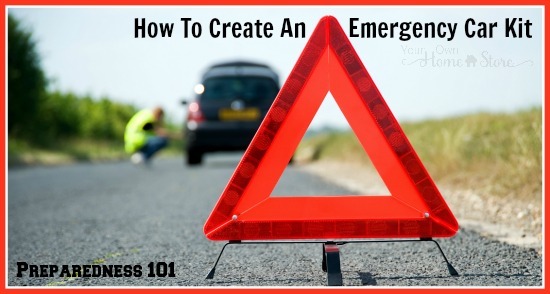 In fact there are some “emergencies” that are really only possible when you are in your car (getting stranded?) As a result, I’ve re-vamped our car kit and I’d like to show you what I’ve done. 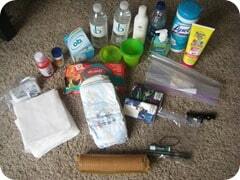 I have taken into consideration the fact that I normally have our full 72 hour kit go-bag in the car. 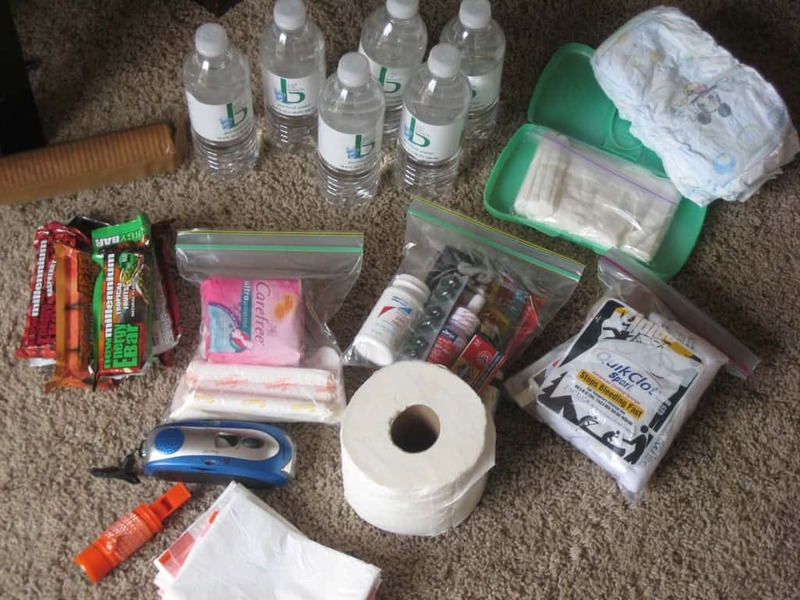 There are things in that kit (like clothes, blankets, basic meds, hygiene items like toothbrushes & soap etc.). As such, I have not included those in my car kit. I also have not included but the most basic shelter type items. In most cases, I believe I could use my car as my shelter. Plus, I have basic shelter items in my 72 hour kit go-bag. I categorized my preparations into 3 separate categories and I’ll go over each individually. There is a natural disaster of sorts and help is not coming for some time. I need to note that I feel a situation where the entire family would need to walk a distance would likely be pretty rare. Even if there was a disaster, we may still be able to (slowly) drive our car to the nearest town. If we breakdown outside of town, we’d likely call a tow truck. If forced to walk to town for any reason, either my husband our myself would walk into town; the other would stay behind with all the kids. I think in most situations, we would be able to better survive in our car then out in the elements. But since I know it may be possible that we would be forced to “evacuate” our car, I’ve included a few provisions in case this happens. You may feel differently. 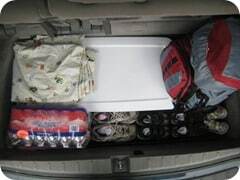 When we go on a road trip, I will take out everything but the tub and we will pack our stuff on top of it / around it. That is why I chose that tub: b/c it is short and long which makes it easy to stack things on top of. I know that would make it difficult to get to if we were stranded, but I’d rather deal with that stress than try to pack it on top of everything! 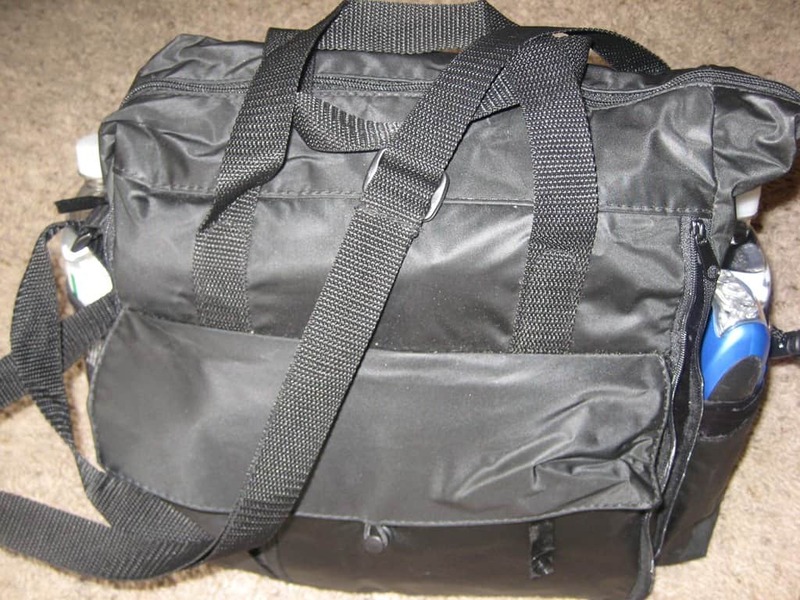 I know that our full 72 hour kit go-bag is in the car too, but I wouldn’t want to carry that (it is HEAVY) unless I had to, so this bag just has what I think I may need to walk into town. A lot of it you likely already have lying around the house! Take a look…I bet you’ll find things you didn’t realize you had! You can also purchase a lot of it through the links above. Anything in green is a link and you can click on the word to be taken to a place where you can purchase that product. Much of it can also be found at your local Target / Walmart. How do you keep the water bottles from freezing during the winter? Keep them in a cooler and they do okay! In September, Mumbai had a flood with thigh high water. The streets in Mumbai are small and difficult to maneuver on a good day. I was home, but many friends were stuck in their cars for hours; some were stuck for 8 hours. 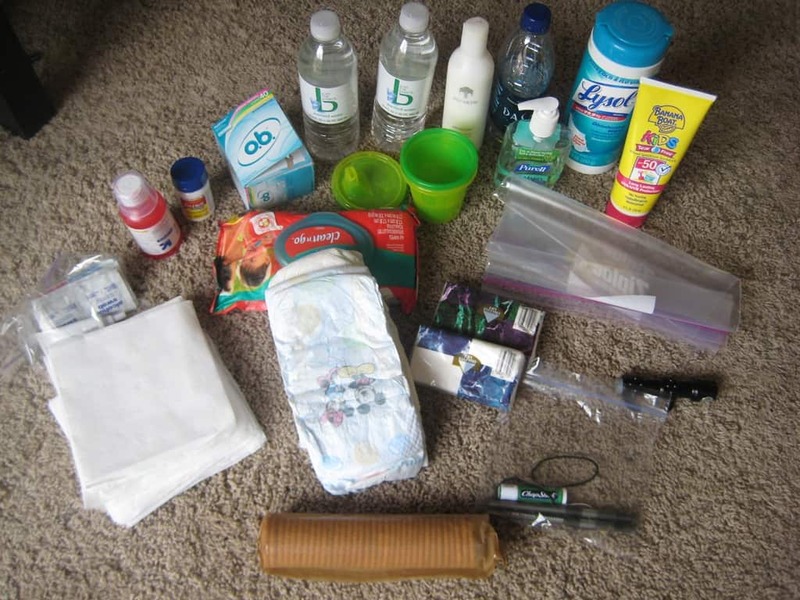 Next monsoon, I sure many will be making a car kit of food and water. 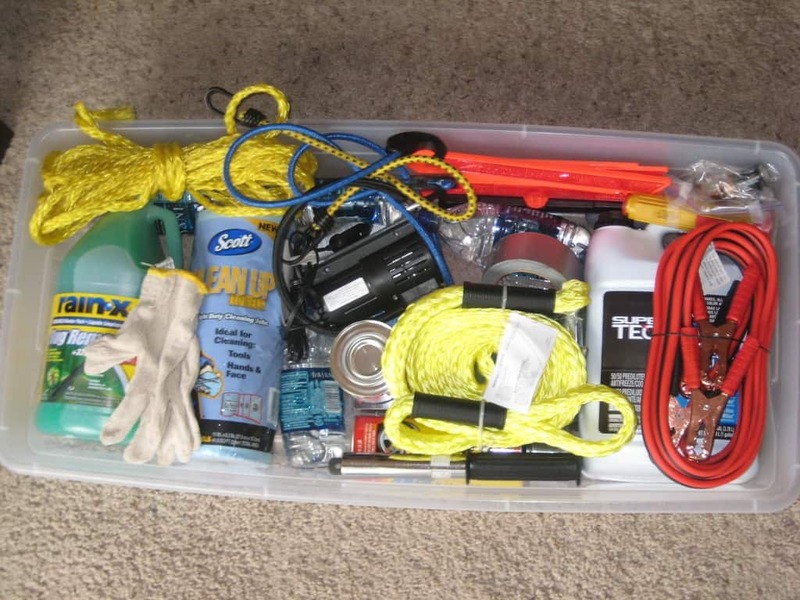 Do you keep both your and your husband’s 72 hour kits in your car at all times? Doesn’t his kit have some things in it that yours does not? Yep. His is in his track and mine is in our van. We’ve packed them accordingly. You have given me a great idea for Christmas gift giving this year. 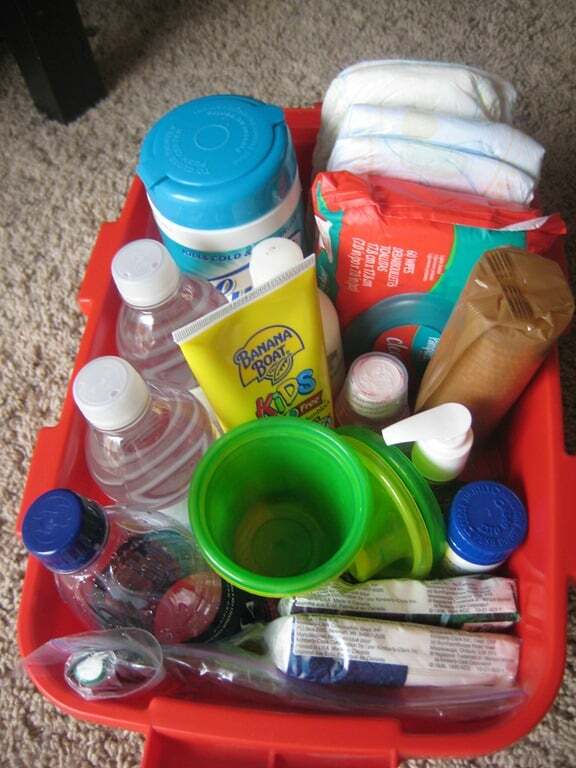 Many of my grandchildren drive their own car so my plan is to put together a car kit for them. Thanks for your inspiration. Yay! I’m glad it was helpful! Thank you so much for your kind words. They mean more than you know! how do I print the list for the car normal and emergency? 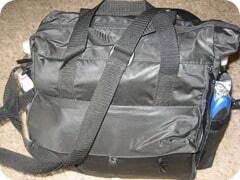 #3 My small SUV doesn’t have a lot of space so if my husband and I are going on a day trip away from are car we have a small back pack with our Go-bag/72 hr. bag, which we can fill from the Go-bag and whatever we have in our picnic basket or the SUV, it really saves on space. Great tips and ideas Amii. Thanks! I had heard that meds could lose their potency, but never heard that they’d become toxic. Do you have any info on this I can read? Tetracycline is the only medication that becomes toxic if stored for long period of time thatIhave heard of. Other solid medication can be stored for many years. If used after expiration date they may loose alittle potency. 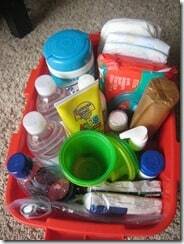 I do not store children’s liquid medication for more than a year past expiration date. You can mixup adult form with water for children. I buy the weakest strength of each antibiotic in order to make mixing easier and also the grandkids might be able to swallow a tablet whole or mixed in their food if they need it. Human powered or solar flashlights are becoming quite common and inexpensive, or, if you want to use one you already have in order to consume less, store the batteries IN the flashlight, using electrical tape to cap the end of the last battery and the spring of the flashlight- think of the tabs that come in toys etc that include the batteries, it just stops the connection so you can store the batteries in place instead of taking up more room, which means less chance they will get lost or be in the way… thinking of you, big ole 4 D cell taking maglight. Amii, if you have a suggestion for a high powered solar / human powered flashlight I’d love it! I have quite a few, but they are all pretty weak sauce next to a battery powered one. And I LOVE the idea of using the electrical tape to cap things. Smart. I have a goal zero camp light- it can charge via solar panels (plugs to usb cord, included) has a crank, and it crazy bright, with adjustments to make the charge last longer. (48 hours on low) best charging comes from plug in of course, but it does have the other options for extended outages. I have a bunch of goal zero products in my home, but hadn’t thought about moving them to my car kit. Thanks Amii! And sorry it took me forever to get back to you! My computer crashed and I’ve been dealing with that for a while! I’ve seen those. Gonna go see if Amazon carries one. Thanks Luci! Try it out. Mine is old and would not start my car. I will try again before buying a new one. I never tried when it was new other than the light and air compressor. Please use caution putting the first extinguisher in the door of your vehicle. A number of fire extinguishers work by displacing the oxygen and/or dispersing powder with the intent to suffocate the fire. If your vehicle was struck in the door, the fire extinguisher might explode releasing those chemicals all over your passenger. None of that is something you want to inhale as you’re gasping from the shock of the accident and it would make it incredibly hard for the first responders to locate injuries. Plus, since the contents of the canister are under pressure, there’s always the chance that any damage caused to the container may turn it into a projectile causing injuries of its own. 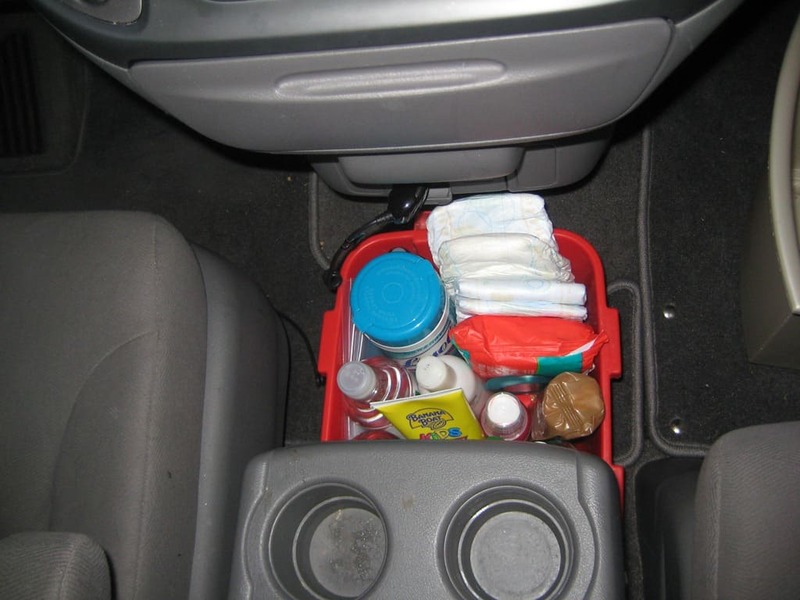 You may want to move it farther into the interior of the car where it is more protected in case of an accident or move it to a compartment further away from passengers. I hadn’t even thought of that April. THANK YOU! I’ve moved the extinguisher to the center of the car. I have one more suggestion for you–extra Benadryl (or other OTC antihistamine) tablets and cream. We do a lot of day hikes in good weather, and it always seems like someone ends up bug-bit or into the poison ivy. Also, I found out the hard way that I had developed an apple allergy–on our way home from an amusement park, having a lovely bowl of caramel apples (my last)–and my throat almost closed up before we found a convenience store to replace the Benadryl we “thought” was in the car. Not everyone has that sort of issue but there are enough people who do–you might end up saving someone else! Obviously anyone who has an issue serious enough to need an Epi-pen should make sure to have a spare of those when going out! Thanks Stacey! Great tips. I do keep Benadryl in my first aid kit. I’m glad I”ve never had to use it! Wow, an apple allergy??? Who would have thought? Benadryl is a good antihistamine except it will cause drowsiness and decreased reaction time for about two days. I only use it for children who would benefit from extra sleep (such as chicken pox). Allegra, Zyrtec, and Claritin work better and an all be purchased without prescriptions. One summer on our long car trip we got stuck behind an accident on the interstate. No exit close by and more importantly no bathroom or privacy outside the vehicle. After some time passed my 4 year old couldnt hold it any longer. After combing the vehicle for ideas I found an old (unused) diaper. Worked perfectly!! Even now I keep a few diapers stashed for that “just in case” moment. There is one thing that I would like to suggest for if you get stranded. A tarp with some tie downs (think shelter). If you are stranded in hot weather the last thing you would want to do is stay in the car with the little ones. 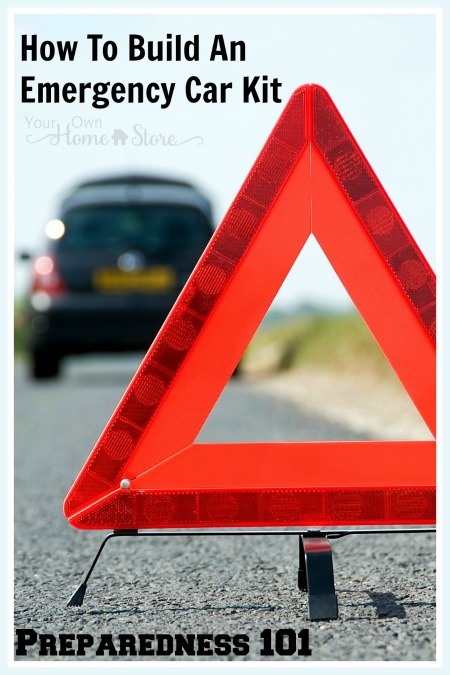 Setting up shade for the car or for a place outside could be lifesaving. Heat stroke is very bad. Thanks for your help in this area. We live only 40 miles away from the wildfires in Colorado, and this info is extremely helpful right now. It gives you some peace of mind to have some things with you, and a small softside folding cooler has helped us more than once, with some water, easy to carry, and if the smoke gets bad, you can put some water on a hankerchief over your face and nose to lessen the effect of the smoke, especially for my little boy. Thanks for your ideas and guidelines, I especially appreciate the lists of what your family has done, because than you don’t have to think so much to get things together to help your family. Thankyou. You are welcome Kelly! Thanks for your additional tips. I pray your situation improves soon! The comments are the best part Deb! So many knowledgeable people here! This is a great post, Misty, and very timely for my family as we are getting ready to travel for a couple weeks. 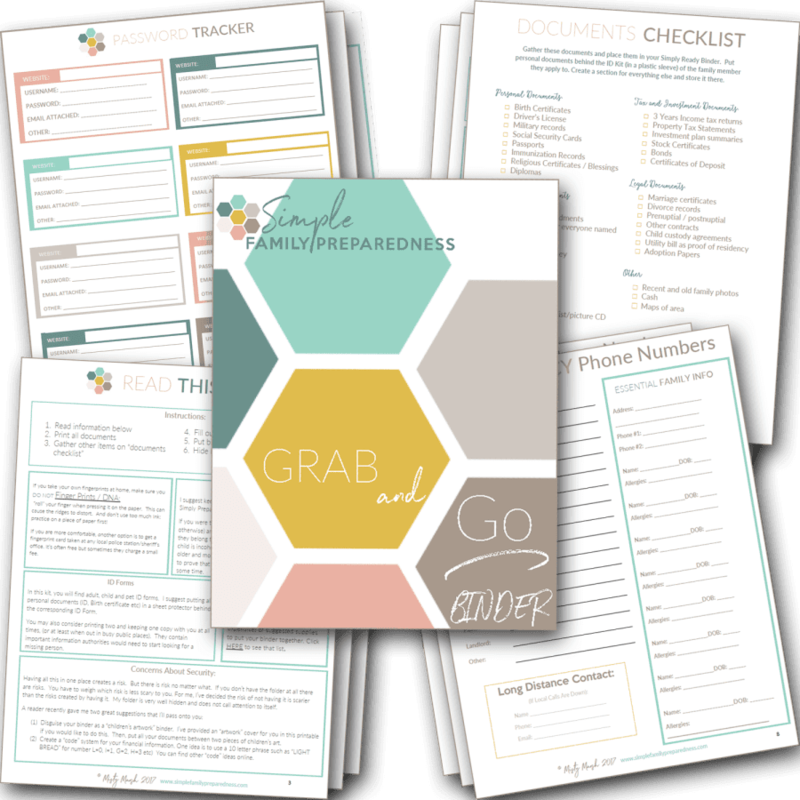 I have quite a few of the things in your everyday emergencies list in my purse at all times anyway, but it would be more useful to just have a set in each vehicle, especially for DH. This time around, my travel emergency kit has to look a little different since we’re going by air. So far, it includes OTC meds, bandages, ointment, a tiny sewing kit, safety pins, printouts of our flights, phone numbers for our airlines, relative’s phone numbers, tissues, and snacks raided from our regular emergency kit. We’ll have to carry our important documents anyway since we’re flying. I wish I had tiny flashlights to include. The small flashlight that I linked to (the link) is my all time favorite Aimee (not that I’ve tried every one out there), but I do really, really like it! this is such a fabulous idea! i always have good intentions to put something like this together… but now i just need to act on them! this list is very helpful!